A few weeks ago, you would not have seen even one head of cattle in Bor Town, South Sudan. The town was still nearly empty after the violent attacks of December 2013 that forced residents to seek refuge on islands in the Nile River, at a mission, or wherever else they thought they would be safe. These days, however, you see more than 1,000 head of cattle roaming around the city—a sign that people are returning to rebuild their lives. 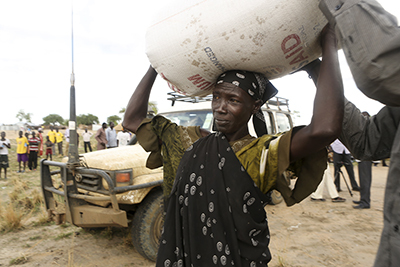 The distribution of food and other essential items in Jonglei State, through humanitarian agencies like Catholic Relief Services, is one reason people are returning home. With the generous support of the American people through the U.S.' Food for Peace program, CRS has provided more than 14,450 households in five counties (Bor, Twic East, Pibor, Pochalla and Uror) with seeds and tools to help them resume farming. The seeds and tools provide hope for a future without hunger. They are motivating people to return from the rudimentary and often unsanitary conditions of their makeshift homes and rebuild their lives. CRS provides hygiene, shelter and kitchen kits first, and later, work opportunities in exchange for food. Workers build critical infrastructure, such as roads and dams. It takes at least 6 months to stabilize communities so they can rebuild for the future. Our main challenge has been getting what we need to support communities in this transition. The conflict wiped out the local market and interrupted distribution channels. Everything we distribute has to come from Juba and is often imported from Kenya and Uganda. This takes time, and rain has made the unpaved roads impassable. Aid agencies have to rely on one another to get things moving and none can work in isolation: We need one another. We work with the logistics and food security clusters, United Nations helicopters and the World Food Program to reach populations in isolated areas affected by the conflict. I am motivated by my faith to continue to work for South Sudan and for CRS. When I look at how people are suffering, I ask myself what I can do to support people in such desperate need. I see the women, the children and the elderly: They are all vulnerable. When I'm distributing seeds, I feel that I'm fulfilling the mission of CRS: to treat everyone without discrimination and to uphold their human dignity. We have not yet reached our goals. South Sudan needs the continued support of the entire global community to do that. If people don't help, widespread famine may result. I'm still hopeful for this country and positive change. Life is returning to normal in Bor. Offices are reopening, the markets are functioning and schools are open. People are trying to—and desperately want to—return to normal.